Click here for learn about birding economics, or to print out your own cards. Tulsa Audubon has launched an on-line version of its Guide to Birding in Oklahoma. The Audubon Society of Central Oklahoma is leading a Lake Hefner habitat restoration project. The Hefner project was featured in the Feb. 20, 2008 issue of the Oklahoma Gazette! 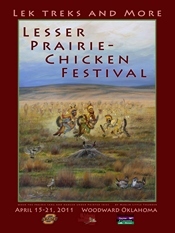 This year's festival includes a chance to see Greater Prairie-Chickens, special packages and workshops for photographers, and will Greg Miller as keynote speaker. 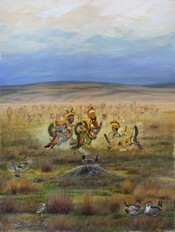 Join the Oklahoma Audubon Council April 15-21, 2011 for an amazing prairie experience! 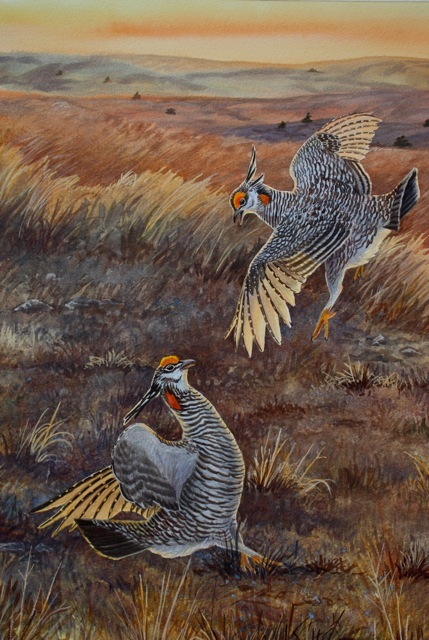 See and hear the quickly vanishing Lesser Prairie-Chicken displaying on its gobbling grounds. Come share and experience the natural heritage of the high plains of northwestern Oklahoma. We are planning a another great slate of field trip and workshops. This year Bill Thompson III will be our featured speaker, and Merlin Little Thunder will be our featured artist. Please click here for the 2011 Registration and Information Form! 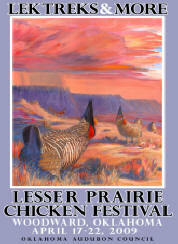 Oklahoma artist Merlin Little Thunder is our featured artist at the 2011 Leks Treks & More Lesser Prairie-Chicken Festival. 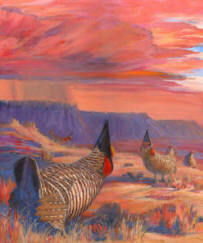 His painting, done for the Oklahoma Audubon Council, When the Prairie Sang and Danced Under Painted Skies, was unveiled at the March Tulsa Audubon Society. Merlin's painting will be available as a signed, limited edition print, and is featured on our festival poster and t-shirt. Please click here to view a larger view of this wonderful work of art. These items will be available in limited quantities at the Festival. If would like to purchase any of these items, please order as soon as possible. If you are attending the Festival you can pick up your items then. If you are not attending the Festival we will ship your order in mid-April. Limited quantities of prints, t-shirts, and posters of Debby Kaspari's painting Selman's Bluff, done for the 2009 festival, and Julie Zickefoose's painting Morning Thunder are also still available. Thank you to the over many participants and volunteers who made our second annual Lek Treks & More: The Woodward Lesser Prairie-Chicken Festival another great success! 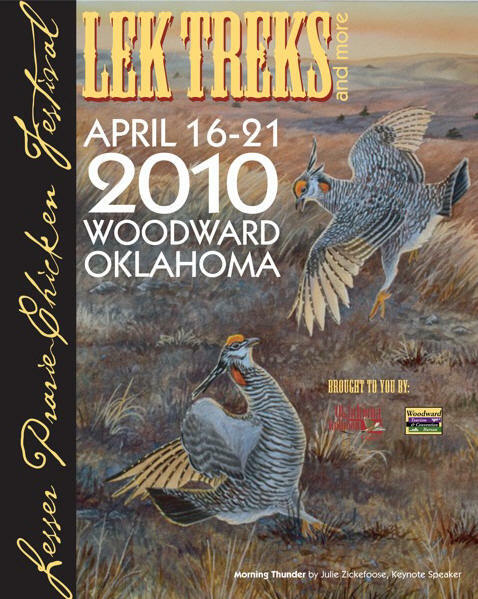 Julise Zickefoose was our featured artist and keynote speaker at the 2010 Leks Treks & More Lesser Prairie-Chicken Festival. Her painting, Morning Thunder, is available as a signed, limited edition print, and is featured on our festival poster and t-shirt. You can read about Julie's experience creating Morning Thunder on several entries on here blog: part one, part two and part three. These items from last year are still available in limited quantities. If would like to purchase any of these items, please order as soon as possible. If you are attending the Festival you can pick up your items then. If you are not attending the Festival we will ship your order in mid-April. Limited quantities of prints, t-shirts, and posters of Debby Kaspari's painting Selman's Bluff, done for the 2009 festival, are also still available. 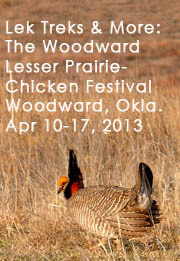 Thank you to the over 100 participants who made the Oklahoma Audubon Council's first annual Lek Treks & More: The Woodward Lesser Prairie-Chicken Festival a great success! We had registrants from 15 different states and two provinces. The Oklahoma Audubon Council is pleased to announce Eric Beck has been hired as Oklahoma's Important Bird Area Coordinator! This is currently a part-time position, but is very significant as Eric is National Audubon's first employee in the state of Oklahoma. Eric's officially works for the National Audubon Society, and the position is a joint effort of all the Audubon chapters in the state. The position is funded by the Oklahoma Audubon Council, and administered by the Tulsa Audubon Society. We were able to accomplish this major milestone through an Innovations Grant from the TogetherGreen program. The primary focus of Eric's work over the next year will be marking fences to protect Lesser Prairie-Chickens in northwest Oklahoma, and to continue implementation of the Important Bird Areas program in Oklahoma. Debby was our featured artist in 2009 and created Selman's Bluff for the festival. Her painting is available as a signed, limited edition print, and is featured on our festival poster and t-shirt. Read about Debby's experience creating Selman's Bluff on her blog, Drawing the Motmot. These items are still available in limited quantities. If ordering for delivery more than one print and/or poster, or for international shipping, email your request to johnkennington@gmail.com and we will send you an invoice with a reduced or international shipping charge. The Oklahoma Audubon Council's Important Bird Area Coordinator Eric Beck has been selected to receive a $10,000 fellowship from National Audubon's TogetherGreen Conservation Leadership Program. The Conservation Leadership program recognizes and nurtures individuals contributing to environmental conservation and restoration. Eric is one of forty promising and proven leaders chosen to receive professional development, training and networking opportunities, plus $10,000 to support a Conservation Action Project. Spring 2008 IBA Update Now Available! Boots, Buckets & Chickens Weekend! 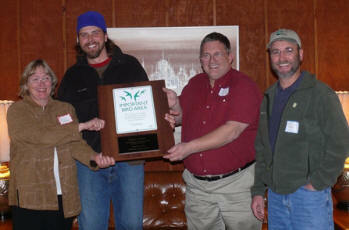 Thank you to all the participants for making the Oklahoma Audubon Council's Boots, Buckets and Chickens! 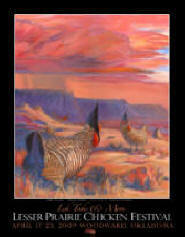 weekend, held April 5-6 at the Selman Ranch, a wonderful success! At the January Council meeting Sue Selman was presented with a plaque recognizing the Selman Ranch as Oklahoma first Important Bird Area! Read all about it in the Winter 2007/08 IBA Update. Also be sure to read the minutes from the Jan. 26 meeting.